Understanding Allama Iqbal’s universal message through reflecting on his stirring poetry, Zainab Cheema takes us on a tour of delight. Sometimes, the date is more than a mark on the orderly grid of a calendar. November 2012 has mostly unfolded as a pageant of blood and violence in Syria and Palestine, accompanied by the crumbling of post-Mubarak hopes for enlightened government in Egypt. However, this month is also the 135th anniversary of the birth of Allama Muhammad Iqbal, perhaps the greatest poetic mind of the 20th Century. Some dates are incandescent, marked with an afterlife of remembrance that erupts through the present. November 9 is a mark of remembrance for a spark that rhetorically invoked a global Muslim Ummah in speech through combining revolutionary political thought with Persian-Urdu-Arabic poetics. Iqbal’s legacy today is limited to being the poet-philosopher who first dreamed of the idea of Pakistan, an independent country for the Muslims of India. Iqbal first announced the idea of Pakistan during his 1930 Allahabad address, proposing a “state in northwestern India for Muslims.” He did not call it Pakistan (which was coined by Chaudhry Rahmat Ali in 1931 who was then a student at Cambridge University in England). Pakistan sees itself as the political fulfillment of the poetic vision that seared audiences for a century, from the men and women attending India’s poetry mushairas in the early-20th century to present-day readers encountering him through poetry collections such as Bang-e-Dara (Call of the Caravan Bell); Bal-i-Jibril (Gabriel’s Wing); and Zarb-e-Kalim (The Rod of Moses). Anniversary celebrations in Pakistan included recitations and musical adaptations of his poetry, attended by corporate big-wigs and army generals who style themselves as custodians of Iqbal’s vision. Until you cut it with the blow of Moses’ rod (Jab tak tu iss zarb-e-kaleemi se na cheere). The world has tired of exalted kings (Zameen mir-e-sultan se baizar hai). 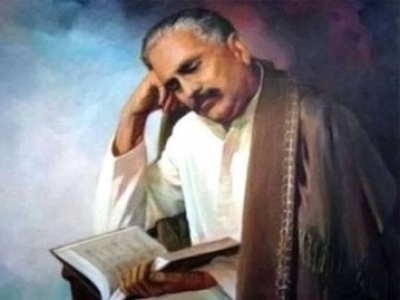 Iqbal’s work then transcends his pedestal as national hero — as Muslims till today largely remain corralled within the paddocks of nationalisms and ethnicisms, his vision mostly remains unrealized. A global celebrity in the 1930s (and even today, esteemed as one of the paramount Muslim intellectuals of the 20th century), his grave now lies near Lahore’s historic Badshahi Masjid, rather forlorn and unattended. Iqbal’s last words indicated his self-awareness as an intellectual before his time — his works were an anodyne to decay, but his revolutionary visions of khudi (selfhood) and collectivity were simply not understood by the public, whether the masses or the technocratic class of middle class Indians who dreamed of change but could not quite transcend their “education” under the British Empire. The speech of Dari is sweeter still (Tarz-e goftar-e Dari shirin tar ast). Nothing may stay hidden for this universe is luminous (Koi shay chup nahin sakti kye alam hai noorani). Scholar, philosopher, and poet, he used his pen to restore confidence to Muslims, mobilizing them against ideological pressures of an age of late imperialism. West and East were fundamentally interlinked, in Iqbal’s view. Intellectual thought moved between geographies, receiving inspiration (and misdirection) from the other — a fact that British (or for the matter, French and German) imperialism strove to disguise. “The most remarkable phenomenon of modern history, however, is the enormous rapidity with which the world of Islam is spiritually moving towards the West,” he wrote in his philosophical text, The Reconstruction of Religious Thought in Islam, “There is nothing wrong in this movement for European culture, on its intellectual side, is only a further development of some of the most important phases of the culture of Islam.” But Iqbal also voices his fear that reform movements may become seduced by Western “modernity” and not preserve their unique intellectual orientation that Islam gives them. Whom You have granted the will to win power in Your name, as the fulfillment of a historical promise (Jinhain tu ne bakhsha hai zuaq-e-khudai). The Color from Arabs’ blood (Qaba chahye iss ko khoon-e-arab se). When their offspring has forgotten skill and God-consciousness (Jis qoum ke bache nahin khuddar-o-hunar mand). If Iqbal moved between the literary and philosophical traditions of Western and Eastern literature, it was through his embrace of storm and stress as the means to truly understand Islamic philosophy — and its unique synergy of the everyday, practical and the transcendent. “With Islam, the ideal and the real are not two opposing forces which cannot be reconciled,” Iqbal wrote. “[Islam] is the perpetual endeavor of the ideal to appropriate the real with a view eventually to absorb it, to convert it into itself and illuminate its whole being.” In other words, the great philosophical questions that Muslim thinkers had extracted from the Qur’an, were about properly managing reality — not condemning it as a perpetual state of fallenness from which a messiah will magically rescue us, as Christianity believed. Proclaim, whose fierce valor once did Khyber’s barriers overthrow (Tu hi keh de ke ukhara dar-e-khyber kis ne)? Or whose might once laid famed Caesar’s proudest cities low (Sheher qaiser ka jo tha, us ko kiya sar kis ne)? Our breasts, with thousand daggers pierced, still struggle with their cry of pain (Mee tapd nala ba nashtar kadah-e-seena-e-maa)! Using metaphors of Sufi kalam, the poetic traditions of Muslim India, the narrator expresses longing for the delirious union of human and divine, when then human embodied the divine will in flesh, and mastered ancient civilizations. Through the complaints, Iqbal winds the sound of the caravan bell; the sound of remembrance, jolting return to the place of the original revolution. Although the singer sings in Hindi, Hijaz is his melody (Naghma hindi hai to kya, lai to hijazi hai meri). Scholar, philosopher, and poet, he used his pen to restore confidence to Muslims, mobilizing them against ideological pressures of an age of late imperialism. His life’s work was to grapple the contradictions of a Muslim collectivity broken under historical defeatism and the secularism sponsored by the British Raj. As was the norm for every Urdu poet of Hind, three-quarters of Iqbal’s poetic output was in Persian, which has given him a considerable afterlife in Iran. His Urdu poetry catalyzed India, presenting lyric protests against imperialism, and offering the dream of a resurgent Muslim global community. As the musical culture of India and Pakistan is grounded in poetry, Iqbal still circulates, the ringing call of his voice circulating in a society that finely appreciates the aesthetics but misses the politics.